Khenpo Phuntsok Tashi was born in Eastern Bhutan and later studied under various enlightened masters both within and outside the Kingdom. 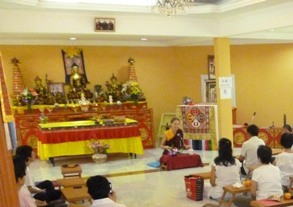 He has earned a Master’s degree in Buddhist Philosophy. Diploma in International Communication from the City University, London. 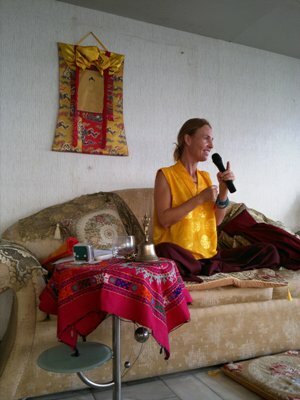 He has been teaching meditation and Buddhism for more than fifteen years in Bhutan and abroad in Europe, the United States and Southeast Asia. 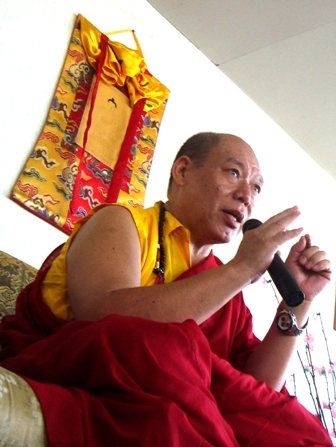 A very clear and articulate teacher, many of Khenpo’s students describe his instructions as eloquent and sharp. His sense of humour and warm personality, which are in true Bhutanese style, join with his character to endear him to his students and guest audiences. Also a prolific scholar, Khenpo has written numerous articles and books, as well as presented his research at several national and international academic and cultural forums. He is a champion of Bhutan’s development policy of Gross National Happiness, finding it greatly congruent with Buddhist philosophy. He strongly believes that happiness is a positive mental state which results from cultivation of contentment, non-violence and the never-ending wish to help others at all times. By integrating mind and body with breathing we can enter into our natural state which is bliss and joy beyond words. Through this non-separation we access power and stability which improves every aspect of our daily life. In this workshop we will be using methods in our physical, mental and energy plane. By accepting our physical and mental states we can skillfully maximize our spiritual potential. By integrating mind and body we can enter into our natural state which is bliss and joy beyond words. Through this non-separation we access power and stability which improves every aspect of our daily life. In this workshop we will be using methods in our physical, mental and energy plane. By accepting our physical and mental states we can skillfully maximize our spiritual potential. The joy and light of the freed mind is a source of a constant flow of happiness and auspiciousness. With this, we live to the fullest. Attachments cover our true nature and by transcending them our infinite potential shines forth. This is the essence of Buddha’s teachings and will help people to extract the profound meaning out of their practice and out of their life.